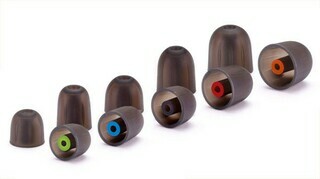 This high-quality construction, paired with 5 distinct and intelligent size profiles to choose from, makes Westone STAR Tips™ one of the very best choices available for replacing your earphone tips, providing the benefits of an affordable near-custom fit and making your earphones or in-ear monitors comfortable enough for serious all-day wear. If you prefer a foam tip over a silicone tip, see Westone's True-Fit Tips™ here. Tip: Not sure which STAR Tip™ size you need? Check out our STAR Tip™ Combo Pack, which contains one pair of each size of tips so you can find the perfect STAR Tip™ to fit your unique ears. Westone STAR Tips™ for Universal In-Ear Monitors and Earphones (1 Pair)5GaryFebruary 20, 2015My grandchild was playing with my W20 earphones and oops, one of the Star silicone tips was missing. I replaced them with the True fit foam and quickly realized the true fits have better isolation but they also have more shock resonance from activity (I am a bicycle rider). The silicones have less isolation but also less shock resonance, in fact, none. For active sports, use the silicones. For relaxing and just listening, use the Stars. Over all, they both far exceed anything I have ever had before.